With its new design and reliable lamination, the DryLam 27" Professional Series Roll Laminator is a great choice for schools, professional shops, or in an office environment that requires dependability and function. The DryLam 27" Professional Series Roll Laminator is loaded with features, making it an extremely versatile and user friendly system. The Professional Series from DryLam is up to 3 times as fast as traditional School Laminators and has a much greater degree of flexibility to accommodate a wider range of film qualities. The DryLam 27" Professional Series Roll Laminator from MyBinding.com is an ideal machine for thermal lamination of a wide variety of prints, ranging from black and white prints to full color posters. Thank you for your purchase of the Dry-Lam Model 27STA 27" Roll Laminator. This laminator was delivered to you in two separate boxes. The large box contains the laminator and the smaller box contains the two supply mandrills, heat guard, and feed table. It is very important to save the large carton. If it should become necessary to ship the laminator back for repair or service, you will need this carton. Please store it in a safe place. You will find the instruction manual in the large box with the laminator. This manual is provided as an operator's manual and covers most situations you will encounter while using your laminator. Once you have placed the laminator in a suitable location as outlined in the unpacking section on page 3 of the instruction manual, we will begin to familiarize the operation of the control panel as now shown. The display of the control panel will show the three different parameters of the machine. By pressing the display button in the upper right hand corner of the control panel, you will read feed which will record and display the footage of the film being used. Pressing the display button again, you will read feed per minute or speed of lamination. Pressing the display button again will display degrees Fahrenheit or temperature of the laminator. Now that we have covered the three parameters of the machine, we will turn the laminator on by pressing the on/off button which is found in the lower left hand corner of the control button. The heat may be adjusted by pressing the temperature controls temp up and temp down buttons in the yellow blocks. The temperature displayed is the temperature set point. This is the temperature that the machine will reach and hold the temperature. The temperature can be increased or decreased in one degree increments by pressing and releasing the up or down button. To rapidly increase or decrease the temperature, press and hold the button. When the machine reaches the set point, the green ready light will illuminate and a two second beep will sound. If a significant change in the set point temperature occurs, the red wait light illuminates until the laminator reaches the new set point temperature. At this time, the green ready light will illuminate. Note: Depending on room conditions and desired set point, it will take between 20 and 30 minutes for the green ready to illuminate. The laminator is equipped with two factory presets. The first button labeled 225 degrees Fahrenheit when pushed will automatically set the machine for 225 degrees Fahrenheit temperature and a speed of three feet per minute. The next preset button labeled 275 degrees Fahrenheit when pushed will automatically set the machine for 275 degree Fahrenheit temperature and a speed of three feet per minute. The motor controls are the four buttons on the right hand side of the control panel. The top button in the green box labeled start will start the motor which will run at the current speed setting. The speed up and speed down buttons also in green blocks will adjust the speed setting. Press and release to adjust speed in increments by 1/10 foot per minute or rapidly adjust speed by holding a button down. To stop the motor, press and release the stop reverse button in the red block. To reverse the motor, press and hold the stop reverse button in the red block. The laminator is equipped with a user defined preset button. This button can be used to save a speed and temperature setting that you have defined. With the machine speed and temperature set to your preferred settings, press and hold the preset button until the beeper sounds and the preset light comes on. To recall this setting at a later time, press and release the preset button. The laminator is equipped with a usage counter that will indicate the feet of film used. This counter will appear on the display whenever the feed indicator light is on. This counter can be reset to 0 by pressing the count reset button once the display is showing the usage counter. The key switch located just below the control panel locks out the motor, allowing the machine to remain here yet preventing unauthorized usage when in the locked position. Transcript: Unpack the supply film roll mandrels. Note that these two mandrels are different. The bottom mandrel is marked low and has a blue label on the right hand slat side. Laminating film is made up of two layers, a glossy layer, which gives the lamination its strength, clarity and rigidity, and a dull or matte side, which is heat-activated and serves as the glue to bond the film to the product being laminated. Once heated, small amounts of the glue can stick to the heat shoes and the rollers must be periodically cleaned of the laminator. Unpack the supply film roll mandrels. Note that these two mandrels are different. The bottom mandrel is marked low and has a blue label on the right hand slat side. Laminating film is made up of two layers, a glossy layer, which gives the lamination its strength, clarity and rigidity, and a dull or matte side, which is heat-activated and serves as the glue to bond the film to the product being laminated. Once heated, small amounts of the glue can stick to the heat shoes and the rollers must be periodically cleaned of the laminator. Laminating film is available in a variety of different lengths, width and thicknesses. The Dry-Lam laminator is designed to use 1.3 mil-, 1.5 mil- and 3 mil- thick films. Insert the mandrel marked low into the core of the film roll with the blue label slat side first, rotating the mandrel in the opposite direction of the gripper points. Center the roll on the mandrel so that there are equal lengths of the mandrel protruding from each side of the film roll. The mandrel and film roll are then to be placed on the lower feed section of the laminator. The slat end where the blue label is should be inserted into the socket. The hanger end is then dropped into the hanger on the left-hand side. At this point, check to make sure when the film is unrolled in an upward direction from the back side of the roll, the shiny side of the film faces the heat shoes and the dull, glue side faces away from the heat shoes. Now, take the mandrel marked top and has a red label on the right hand slat side. Insert the mandrel marked top into the core of the film roll with the red label slide in side first, rotating the mandrel in the opposite direction of the gripper points. Continue this process until the roll is centered on the mandrel with equal lengths of the mandrel protruding from each side of the roll. The mandrel and the film roll are to be placed on the upper feed section of the laminator, the slat end where the red label is to the right-hand side and inserted into the socket. The hanger end is now dropped into the hanger. At this point, check to make sure that when the film is unrolled in a downward direction from the back side of the roll, the shiny side of the film faces the heat shoes and that the dull, glue side faces away from the heat shoes. At this point, the laminator has not been turned on and, therefore, the heat shoes are cold, making it easier to thread the film through the machine. Pull approximately one to two feet of film off of each roll. Using threading guide appearing on page 14 of the instruction manual, thread the film around the idle rollers and then overlap the top and bottom film leads. Turn on the key switch. Start the motor by pressing the ‘Motor Start’ button and reduce the speed to one foot per minute. Feed the threading board and film in between the heat shoes. Make sure the threading board is leading the film through the front feed rollers. Continue to monitor the progress of threading. As the threading continues, use the back side of the laminator to confirm that the threading board and film are moving through the back pull rollers. When the threading has been completed, remove the threading board and stop the motor. Check to be sure that the top and bottom rolls of film are in line with each other. Adjust if necessary. Install the feed table. Set the side guide of the feed table for your work. Install the heat guard. The machine is now ready to laminate. Push the ‘On’ button. Select and push the ‘Preset’ button for the temperature of the film you have on the machine. When the ready light is on, start the motor and adjust the roll tension knobs located on the right-hand side. Refer to page 15 section E of the instruction manual for details. A film cutter is supplied and attaches to the machine with a magnet. It is located on the left-hand side of the machine. Two thermometers are installed on the left-hand side of the machine, one for each heat shoe. To laminate, press the ‘Motor Start’ button and insert the paper to be laminated. Move the paper gently forward and allow the machine to take it from you. Monitor the paper as it passes into the machine. Monitor the paper as it exits from the machine. Allow the paper to exit a couple of inches beyond the back pull rollers. Then stop the machine by pushing the ‘Motor Stop’ button in the lower right-hand side of the control panel. Take the film cutter from the left-hand side of the machine and cut the laminated paper from the roll. Refer to the instruction manual for complete and detailed information on the operation of your laminator. Roll laminators are great machines that can really make both office and school work last longer and stand out. 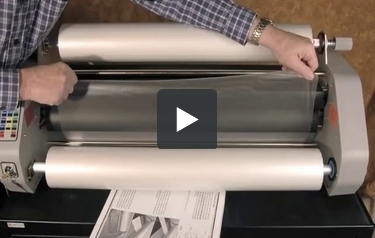 If you're looking for one of these devices, you'll want to check out the DryLam 27" Roll Laminator. It has a lot of features that make it user-friendly but there are some things to consider before investing in it. Here are its strengths and weaknesses for your perusal. The DryLam 27" has a laminating width of 27 inches. This is a fantastic width because it will allow you to process a variety of items both large and small. Some possibilities include posters, menus, bookmarks, signage, and more. You'll also be able to laminate paper that's letter-sized (8.5" x 11") and larger. This machine is pretty speedy. It's able to process up to 9.5' of material in one minute. In fact, this device is up to 3 times as fast as some of the other roll laminators on the market. This will definitely come in handy when you have a lot of items to laminate. This machine has a key switch feature that prevents unauthorized use. This would make this device a good choice for schools because it's pretty safe to use. (There's also a protective safety shield so fingers can't come into contact with the machine's heating element or its hot rollers.) It can also help you preserve laminating film and thus, save money. There are preset speed and temperature settings that make this machine incredibly easy to use. The device has a digital control panel so all the settings you need are right at your fingertips. (Even the temperature will be shown digitally, as well as how much film you've used.) And if you run into any problems while laminating, you can use the reverse mode to get things back on track. The DryLam 27" comes with a one-year warranty so any necessary repairs can be taken care of without any hassle. 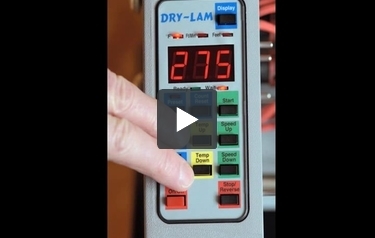 The DryLam 27" isn't the smallest laminator around due to its laminating width. This product's dimensions are 15" (height) x 34" (width) x 20" (depth) and it weighs just over 70 pounds. Because of this, you may want to keep this device in a copy room rather than an office. This machine is only compatible with laminating film that's 1.5 or 3 mil thick. Therefore, this isn't the machine to use if your laminated documents will be handled frequently or placed outdoors where they'll be exposed to sun, wind, and precipitation. The rolls of film you use need to have a 1" core. Instead of an integrated cross-cutter, this machine comes with a hand-held slitter. There is a storage area for this gadget in the machine, but it's just not the same as having a built-in cross-cutter. Overall, the DryLam 27" Roll Laminator would be a decent choice if you're in the market for a machine such as this. It's pretty fast and user-friendly, plus it comes with safety features that are more than adequate. However, this isn't the best choice if you need a device that can handle thick laminating film or if you want a small laminator. But, if that's not the case, you may find that this product is just right for your needs. We have Laminator mODEL drylam 27 sERIAL c1547-606 COLOR GREY iTEM # 201309 WHICH FILM DO I NEED TO ORDER? Thank you for you question. The DryLam 27" Professional Series Roll Laminator is able to use 1.5 mil or 3.0 mil standard grade , premium (low melt) grade , or school grade films that are up to 27" wide on a 1" core.